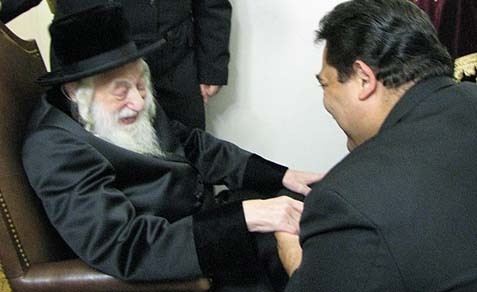 The Skulener Rebbe, Rabbi Yisroel Avrohom Portugal of blessed memory, passed away Monday afternoon at the age of 95 at John Hopkins University Hospital in Baltimore, surrounded by his family and closest chassidim. The Rebbe was admitted to John Hopkins in early February, and remained in the hospital since that time. Born in Romania to the previous Skulener Rebbe, Rabbi Eliezer Zusia Portugal zt’l and Rebetzin Shayna Rochel, the Rebbe came to the United States as an immigrant together with his father in 1960 after having survived the Nazi death camps in World War II. The two, imprisoned by Romanian authorities in 1959 for teaching Torah, were freed through the intervention of United Nations Secretary-General Dag Hammarskjöld and U.S. Senator Robert “Scoop” Jackson. The Rebbe headed the Chesed L’Avraham organization that was founded by his father, the previous Rebbe, and which houses, clothes and feeds hundreds of children each year. He was also known for the thousands of niggunim he composed; the Rebbe carried a tape recorder with him at times in order to be able to capture the melodies as they came to him. The Rebbe and his Rebbetzin, who predeceased him in 2005, were the parents of eight children. Tens of thousands of mourners are expected to attend the massive funeral for the Rebbe, scheduled to be held in the Boro Park section of Brooklyn on Tuesday morning at 11 am at the Skulener Bais Medrash at 1315 54th Street. 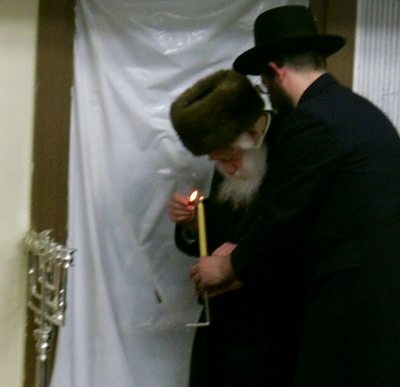 The Rebbe will be laid to rest at the Vizhnitzer cemetery in Monsey, next to his father, the previous Skulener Rebbe.